Berlin parking: model or warning? Many cities in Europe have impressive transport and parking policies. But many also have serious problems that are all too familiar. 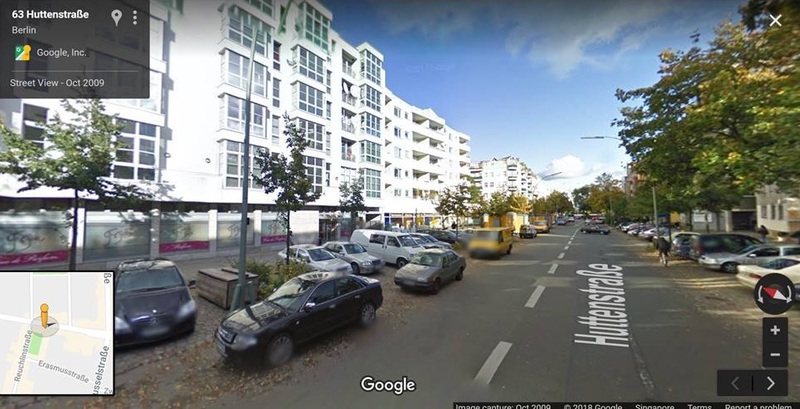 Berlin's parking scene is a good example, as I found in conversation with Berlin parking expert, Jos Nino Notz (scroll down to the end to learn more about Nino). Berlin is a parking-policy model in some ways (as you can hear in this podcast episode or can read in the brief summary below). 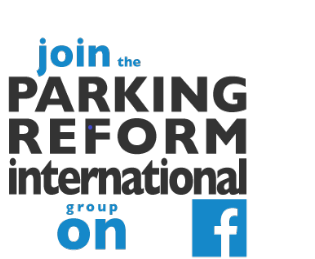 In particular, it boldly abolished its parking minimums more than 20 years ago. It also has admirable parking management in the urban core (and certain other areas). But elsewhere in the city, parking management, especially enforcement, is surprisingly weak (for surprising reasons). READ the article below, which summarizes key points from our conversation. You will be able to get a nicely-formatted full transcript if you become a Patreon patron. Do you listen to podcasts? If so, listen with your usual podcast player app and subscribe (it's free) to the Reinventing Parking audio podcast! (search for 'Reinventing Parking' in your podcast player app or you can click the symbol that looks like a wifi icon in the player above). but certain high-end, 'international standard' developments still provide plentiful parking. I asked Nino about any backlash to the axing of parking minimums. What backlash? There was no backlash, as far as he knows. Parking minimum abolition seems to have been a wonkish issue that didn't get much vocal political attention. The lack of backlash is probably also a testament to excellent alternatives to driving and to Berlin's low levels of car ownership compared with Germany as a whole. Only a little over 50% of Berlin households own a car and ownership rates are especially low in the core districts. But there is still some conflict over parking in Berlin. Residents of some dense Berlin districts do protest at threats to their precious on-street parking, such as new developments and street-space reallocation proposals. But they don't call for parking minimums as a remedy apparently. 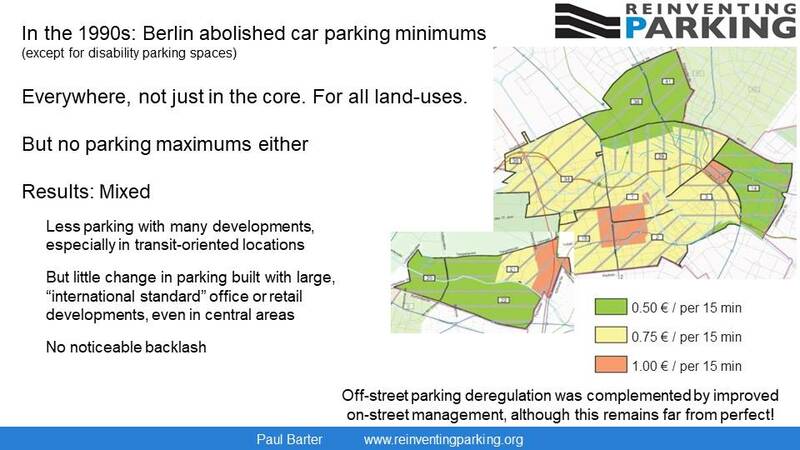 I am still a little puzzled (and impressed) by the lack of backlash against the abolition of Berlin's parking minimums, especially in light of weaknesses in on-street parking management discussed below. Before we get to the weaknesses, we must note that on-street parking management is actually exemplary in several of Berlin's local boroughs. It is this more local level of government which is responsible for implementation of on-street parking management. As Nino explained, parking management is effective, without being especially innovative or cutting edge, in areas such as Mitte and Prenzlauer Berg (the southern part of the borough of Pankow). Berlin has weaknesses in its on-street parking management in many areas. Enforcement is effective in areas with priced and managed parking. But beyond those areas, enforcement seems a surprisingly low priority, resulting in widespread illegal parking and double parking at busy times. Even busy shopping streets lack both pricing and effective enforcement. One consequence of this is a pattern of parking concerns standing in the way of street-space reallocation efforts, including an ambitious plan for a network of high-quality bicycle lanes. Some reasons for this are familiar. Some are surprising. An unsurprising reason for poor parking management in most of Berlin's boroughs is a set of negative attitudes towards parking management. For example, despite Berlin's reputation for sustaiable transport excellence, its motorists often view parking fees or fines as taxes in disguise, just like motorists almost everywhere. But Nino explained a more surprising set of causes of Berlin's parking enforcement and pricing deficiencies: German Federal Government laws. on-street parking pricing proposals face a significant burden to prove they are justified. fines for parking violations are kept at such low levels that local governments find enforcement difficult to fund or justify, except in areas with revenue from parking fees. the price of residential parking permits is capped at 30 Euros. As a result of these, Berlin's parking management problems are repeated across much of Germany. Nino and other proponents of parking change in Germany are unhappy that the regulations make it difficult (or impossible) for cities to use parking policy in strategic ways, as part of a sustainable mobility vision for example. My own view is that, so long as on-street parking is well designed in line with each street's agreed-upon purposes, it is OK to manage that parking as a technical matter of preventing high occupancies and preventing illegal parking. The main opportunity, I think, to use parking as a strategic mobility management tool is via parking maximums for transit-oriented locations. Unfortunately, Berlin lacks this tool for now. Nino highlighted that Berlin's Senate drew up plans for such parking maximums in the 1990s (at the same time as the parking minimums were abolished) but the plan for maximums was too contentious and was shelved. For more details on all of these issues, do listen to the episode. I enjoyed the conversation and learned a lot. I hope you will too. I received many excellent suggestions when I reached out to my network asking for parking people in Germany to talk to. In fact, I hope to interview some of the others at a later date. 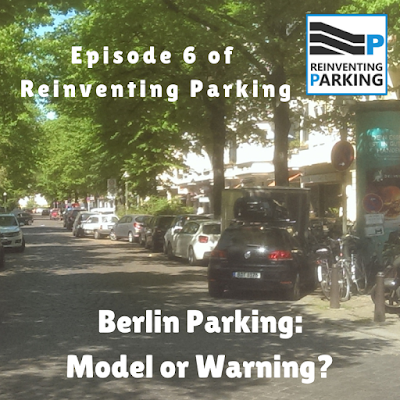 But for this episode, I decided to focus on Berlin and to talk with Jos Nino Notz, who I was able to meet when I visited Berlin recently (for Agora Verkehrwende), and whose Masters thesis at the Technical University of Berlin looked at conflict between parking and public space from various angles. Nino has been working for several years as a traffic planner and consultant in Berlin before recently joining the Cities Team at BuroHappold Engineering. You can learn more about Nino here. subscribe to the audio podcast (search for 'Reinventing Parking' in your podcast player app or you can click the symbol that looks like a wifi signal strength icon in the player below). Appreciate reading this as we consider changes in our system here in the suburban Boston city of Watertown. We succeeded in reducing parking minimums a few years ago but I've been advocated for further reductions or removals along the bus lines to Boston. These bus routes pass through major streets which were once lined with industrial site and the large properties and zoning there has allowed for the construction of larger residential and commercial developments. Since we're a small town, these aren't that far from quiet, single-family neighborhoods. The interface is tricky and traffic issues are the number 1 concern of our residents. We recently passed a TDM ordinance setting aspirational goals for SOV commute reduction citywide as well as requirements for TDM plans in these new, large developments. We still have a long ways to go and things are complicated. Berlin's story is contains good, honest lessons for us to learn from. Please keep up the good work of sharing these kinds of stories and I love your website and emails. Dear Aaron. Thanks for sharing your issues from Watertown. And many thanks for the encouraging words. It means a lot to get some feedback, especially positive feedback.